Recently I was contacted by the folks at the local company The Brinery about trying out their latest product. 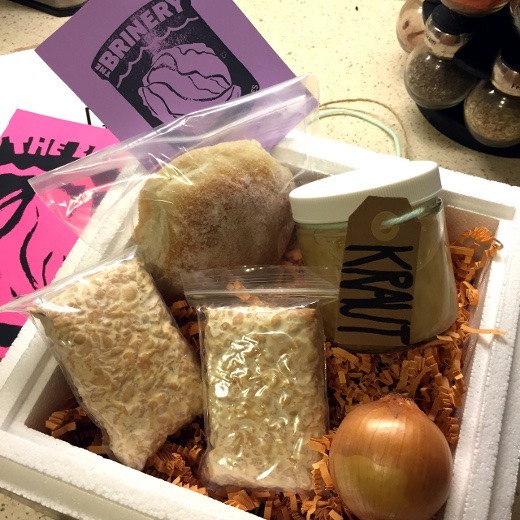 The Brinery specializes in all things preserved and fermented – pickles, kimchi, sauerkraut, sriracha, and now, tempeh. What is tempeh you ask? Tempeh is a meat-free protein that is a favorite of many vegetarians and vegans (but can be enjoyed by anyone). Produced using a centuries-old fermentation process, The Brinery soaks locally-sourced organic, non-GMO soybeans and grains, which are then cooked with a culture, incubated, and left to bloom, which creates a white, firm, loaf-life product. I’m going to be honest with you. 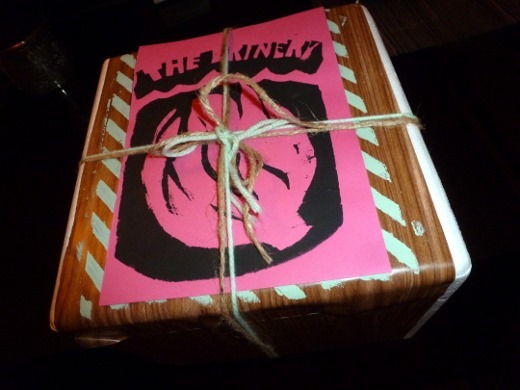 The first – and only – time I’ve ever had tempeh was five years ago at Fleetwood Diner at about 2:30 AM, after a crazy night at the Blind Pig with Five Cent Femme, and I really didn’t even know what I was ordering. I knew I wanted some hippie hash (crispy hash browns topped with sautéed green pepper. onion, tomato, broccoli, and mushrooms, topped with briny feta cheese, for anyone who is unfamiliar) and decided to be “adventurous” and order the tempeh version even though I had no idea what that meant. 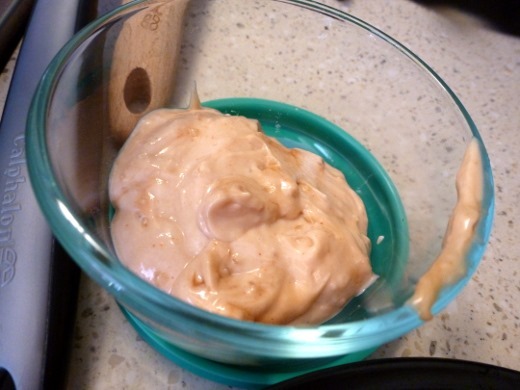 Meanwhile I made a homemade Russian dressing (I just used one of the first Google results returned for “homemade Russian dressing.”) It’s mostly ketchup and mayo, and a lil dash of horseradish for bite. 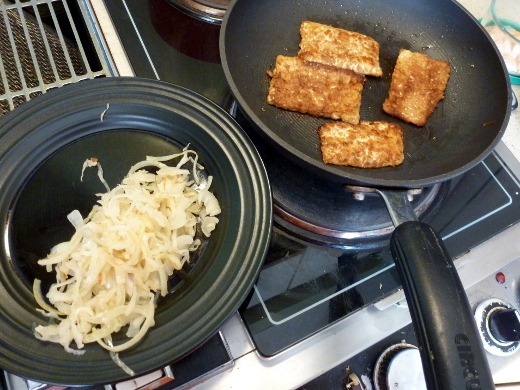 Lastly, I sautéed The Brinery’s sauerkraut with some sliced onion in a skillet for a few minutes, then sautéed the marinated tempeh for 3-4 minutes per side over medium-high heat. 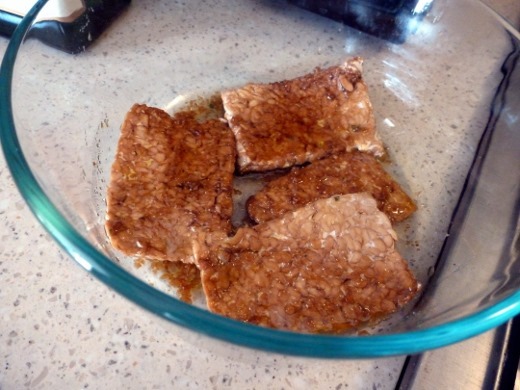 If I made these again, I’d be sure to crank the heat on that tempeh to get a crispier exterior. In case you haven’t guessed what I was making, these are all elements needed to create a Tempeh Reuben Sandwich! The bread is homemade, prepared using local company Easy Artisan’s Old World Rye bread mix, and I also included a slice of provolone cheese on my sandwich. And there you have it! 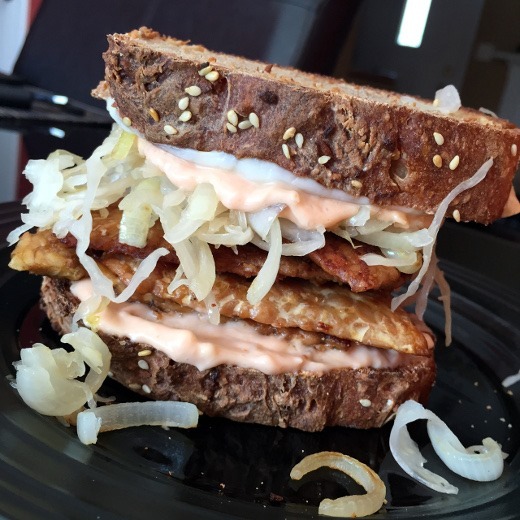 A Tempeh Reuben. Hope you enjoyed reading about my kitchen experimentation and the shout-outs to a few local Michigan companies. Wow this looks awesome. You are so lucky to have a Lunch Room recipe…. 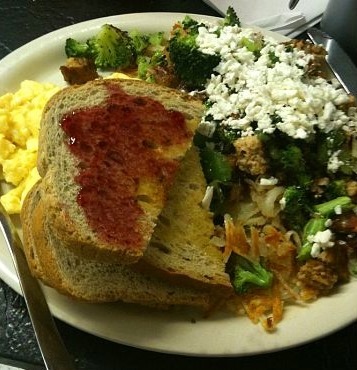 I have to now try the tempeh hash at Fleetwood! Thank you! I’m happy to share if you’re interested! Feel free to shoot me at email (bottom of my About page). 😀 Now I’m craving hippie hash!